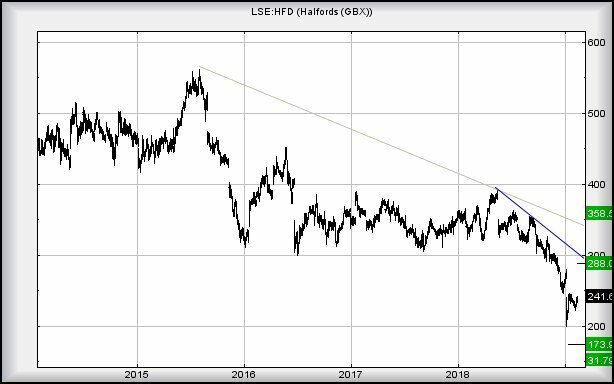 Halfords #DAX #CAC40 On the basis nothing says “Happy Valentine” quite like a muddy mountain bike… we’re taking a look at Halfords. Certainly, if the media are to be believed, post-Brexit we will be unable to afford cars, in a post-apocalyptic world, cycling everywhere. In fact, a bit like London already! Certainly, when reviewing Halford, there is something which sticks out like a sore thumb. The price hasn’t entirely fallen off a cliff and perhaps is showing some strength. To get the bad news out of the way, in the event it now trades below 199p, we’re looking at reversal to an initial 173p. The real problem comes, if such a point breaks, as our secondary calculates at 31p. We rather suspect the company will require issue some really grotty news for such a disaster to happen. We’re inclined to take heart from the drop in January as it provided the perfect opportunity to trash the price down to 173p. Instead, the share was bounced from 199p quite convincingly and therefore, perhaps some strength is evident. The situation now is fairly useful. In the event of the share now trading above 247p, we shall regard it as entering a cycle to an initial 288p. We’ve ample visual reason to expect some stutters at such a level. Only with closure above 288p dare we mention our secondary calculates at a longer term 358p at present. In fairness, in the event of it reaching 288p, we should really revisit the numbers as the longer term future risks being quite confused, thanks to several massive gaps at the start of trade. This level of manipulation tends fog the numbers. With Halfords trading at 241, we suspect it shall prove worth watching in the year ahead.